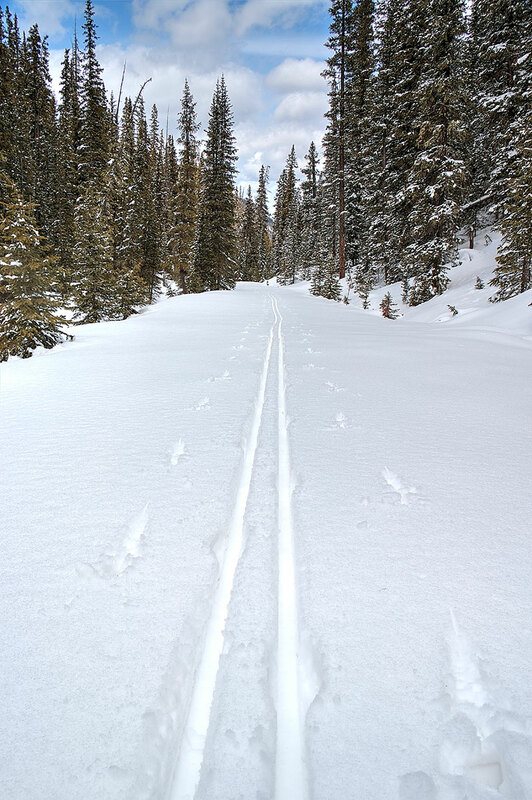 Driving on Highway 40 through Grand County gives one the distinct impression that the cross-country skiing is done for the year. Bare ground has crept up the valleys, reaching many of the places that we normally seek out for our nordic touring. Most people seeing this are of a mind to hang up the skinny sticks and move on to more summery activities. If you are one of the passionate die-hards who moved here because of the fantastic ski touring adventure opportunities, or just wondering what to do on a muddy day, the season of snow is not quite dead yet. 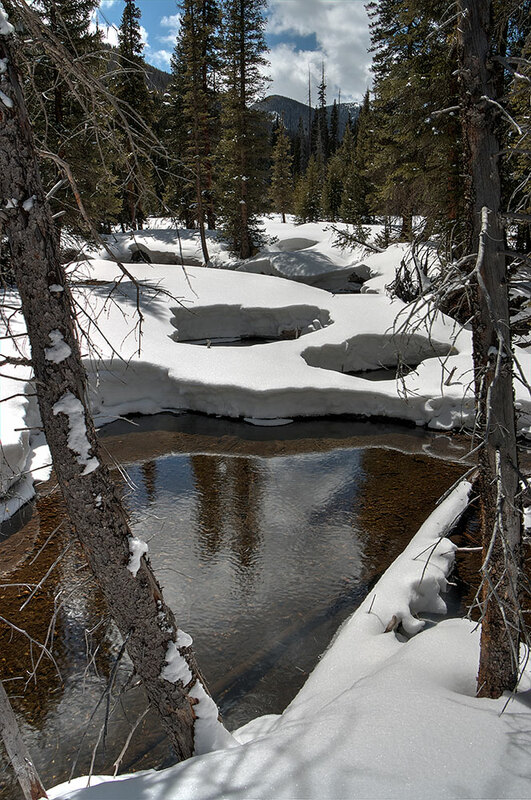 One merely has to follow up the valleys to find evidence of winter that the creeping warmth that follows the Colorado River drainages upstream has yet to melt away. Just as in the autumn, the Experimental Forest continues to prove itself to be a season-extender. Popular summer trails such as Flume and Creekside have begun to succumb to expanding tree wells, and where the trail lies on warm sunny slopes the protective white coat is gone, but the roads continue to be buried beneath a thick blanket. Mornings are best if you like your skiing fast and crisp, and if it has been cold enough overnight, the bombproof snowpack will allow you to go anywhere. Mid-day and later will generally provide much softer, but slower conditions. With continued warmth overnight, skiers will have to keep climbing in elevation to stay with remaining snow. With occasional days that continue to feel wintry, it is good to know we have options to get us out of the mud, especially for those who feel that this winter was just too weirdly warm and short. We can move up to stay with the snow. or move on to next season’s activities. At least we have a choice. The place looks awesome. I definitely would like to visit someday.